People with lived experience of mental health problems will be using their experience to help others. 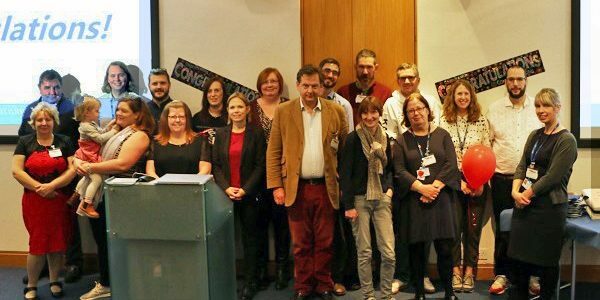 On Thursday, 15 November, trainees in Oxford Health’s peer support worker programme graduated from their six-month training course and became qualified peer support workers. Led by trained educators, the programme seeks to encourage openness about personal mental health experiences, challenge stigmas surrounding mental health and to improve relationships with patients by breaking down barriers of power. The free programme was initially introduced in March 2017, with this recent graduation signalling the completion of the first round of training which launched in April of this year. Each of the 14 peer support workers who graduated from the programme has lived (first-hand) experience of poor mental health, and is using this experience to help others on their own journey to recovery. William Gibson, peer support lead and co-ordinator of the programme, said: “Peer support is about being alongside people during the most difficult periods of their lives and holding hope for them that things will improve. The successful graduates, who have now been offered paid roles with the trust, will use the knowledge developed through their own experiences in combination with the skills learnt in the training course to work alongside staff here at Oxford Health to help with treatment of others in our care. The group was also recently acknowledged in the 2018 Staff Recognition Awards, where the newly graduated peer support workers took home Volunteer of the Year alongside trust volunteer Mary Ward.